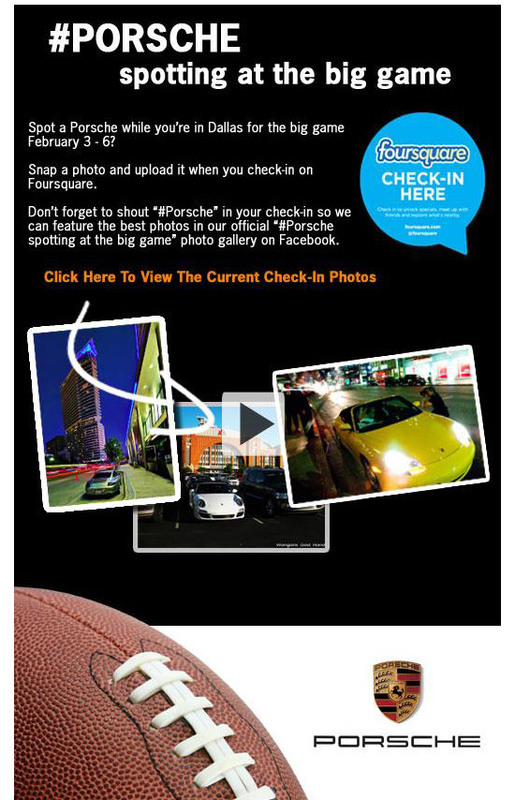 During Super Bowl weekend in Dallas, Porsche are aiming to create a real-time online photo gallery on Facebook using Foursquare photo check-in's. Foursquare users at the Super Bowl find a Porsche in Dallas, check-in from that location with a photo attached and syndicate their Porsche Super Bowl check-in to Twitter using #Porsche as a hashtag. Porsche will then scan Twitter and upload the best Super Bowl Porsche photos to the online gallery which is hosted on a 'Big Game' tab on the Porsche Facebook Page. The Porsche FourSquare Super Bowl activity will also be complemented by a range of Porsche cars around Dallas and available to test drive over Super Bowl weekend. beautiful car. thank you for sharing.